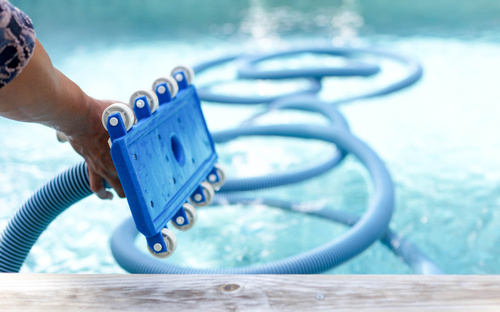 Triangle Swimming Pool Services Company provides the best commercial and residential pool repair and maintenance in Pinellas County. Your professional expert water maids are only a phone call away from turning your dirty backyard pool into a paradise. Don’t you wish that often, as in every day, you could just simply escape and seek refuge from the hardships of the real world which exists outside your home? Work, kids, and school can all be lovely but stressful factors to your busy days. We completely understand, and thus operate under the philosophy that no person should be living with stress in his/her private residence. There is nothing more relaxing and satisfying than stripping down to your swimwear after a long day of work, and going a few private rounds in your deep, clean, and sanitary backyard hole of liquid heaven. However, even lounging and swimming in heaven comes with cleaning, maintenance, and repair costs. Your job is to choose the most efficient expert aquatic angels within Pinellas County who are devoted to your protection, keeping you safe from the dreadful diseases and chemicals which result from unsanitary conditions as well as lack of proper care. Our primary mission is to keep you relaxed and satisfied by providing you with top notch high quality residential and commercial swimming pool services in Pinellas County. As your aquatic angels, you can be certain that our services are focused on keeping you safe and excited to return to your personal backyard paradise each and every day. With us on your poolside, even Olympic champion swimmer Michael Phelps will want to pause from doing Subway commercials and immediately take a few laps in your liquid lounge of beauty! Unfortunately, the reality of him actually visiting is highly unlikely if you don’t know him personally. However, the fact is that your physical and emotional well-being is our main concern. Did you know that swimming is one the best and most sufficient ways to exercise your entire body as well? There is no way to accomplish this task in private paradise with a dirty pool. We all want to be physically fit and healthy. Swimming can relieve joint pain, any lower back pain, reduce stiffness, and help your muscles to relax. It can also lower high blood sugar levels caused by diabetes. We’re truly here to help you with the progression and improvement of your physical state and quality of life. Utilize our swimming pool services in Pinellas County to keep yourself in shape and stress-free, thus being able to focus more on accomplishing your goals and dreams. Our commercial cleaning services include visits three times a week, flat fees, and chemicals and labor. Residential services include water testing, vacuuming, skimming, as well as tile and filter cleaning. We also have the best equipment in the industry today including Pentair Partners, Hayward, Bioguard, and more. The prices are very reasonable to help many families that are swimming in debt and financial hardships. We take pride in diving into your satisfaction and happiness, not into your pockets. We’re only one simple phone call away. Allow the best swimming pool services in Pinellas County to transform your pool today! We happily service the areas of St Pete, Largo, Seminole, Clearwater, and all other surrounding Florida areas! (727) 531-0473.